Valerie Doble focuses her practice primarily on the representation of lenders, servicers and their agents in all aspects of litigation arising out of contested foreclosures, priority liens and title defects in Connecticut, Massachusetts and Rhode Island courts. Ms. Doble also represents mortgage lenders and servicers in cases involving allegations of mortgage fraud and violation of consumer protection statutes relative to loan origination and servicing. In addition, Ms. Doble defends commercial clients in matters involving claims for property damage, personal injury, contract liability, products liability and professional liability. She is experienced in all phases of litigation and alternative dispute resolution. She has represented insureds, insurance companies, brokers and consultants, municipalities, contractors, commercial airlines, and product manufacturers and distributors, and has assisted as coordinating defense counsel for medical device manufacturers in nationwide mass tort litigation. 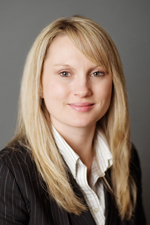 Ms. Doble joined Hinshaw & Culbertson LLP in January 2011. Previously she was for more than two years an associate at Wilson, Elser, Moskowitz, Edelman & Dicker LLP in Boston. She began her legal career as an associate at Bonner, Kiernan, Trebach & Crociata in 2005. During law school, Ms. Doble served as a judicial intern for the Honorable Michael C. Lauranzano, Lynn District Court in 2004 and also for the Honorable Peter W. Agnes, Jr., Worcester and Salem Superior Courts in 2005.